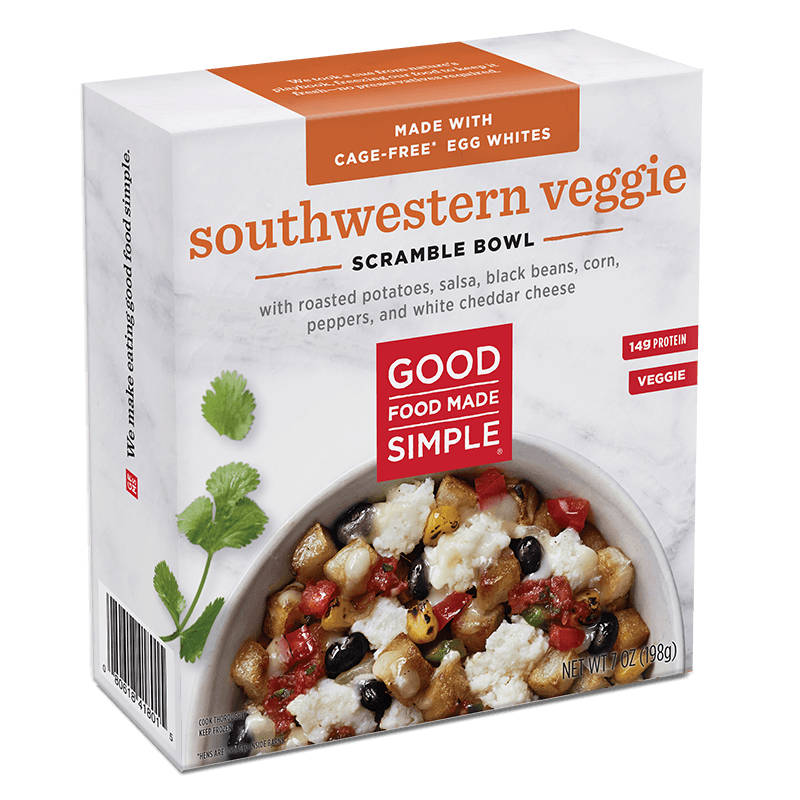 We used the freshest, natural flavors to deliver the perfect Southwestern taste profile. Organic corn, tangy salsa, black beans and a pinch of chili powder turn up the heat, while organic roasted Russet potatoes and egg-whites give this bowl the perfect hearty, protein-packed pick-me-up every morning deserves. Scrambled egg whites (cage free egg whites, whole milk, cornstarch, sea salt, pepper), organic roasted russet potatoes (organic potatoes with organic olive oil), salsa (diced tomatoes, water, jalapeño peppers, tomato paste, onions, distilled vinegar, dehydrated onions, salt, dehydrated garlic, natural flavor), white sharp cheddar cheese ([cultured pasteurized milk, salt, enzymes] potato starch and corn starch [to prevent caking]), organic black beans, organic super sweet corn, organic red peppers, organic green peppers, organic onions, organic cilantro, spices. Your last bite’s as good as your first when bowls are bursting with fresh chopped veggies. We’re talking roasted potatoes, sun-kissed tomatoes, flash-sautéed spinach and just-shucked corn.